You probably don’t read the Daily Mail unless you’re in the UK and watch Jeremy Kyle. Clearly however this is a mainstream newspaper for the general non techy public. It’s here in NEWS not just a special section for gadgets and tech. For a phone to be noticed on this level is somewhat amazing for Nokia and something they have to continue (as well as updating every other thing on their phone, screen res, processor etc, if at least just to please the number munchers). You can tell it’s the Daily Mail from their headline, lol, they just had to get that “iPhone” line in the title. 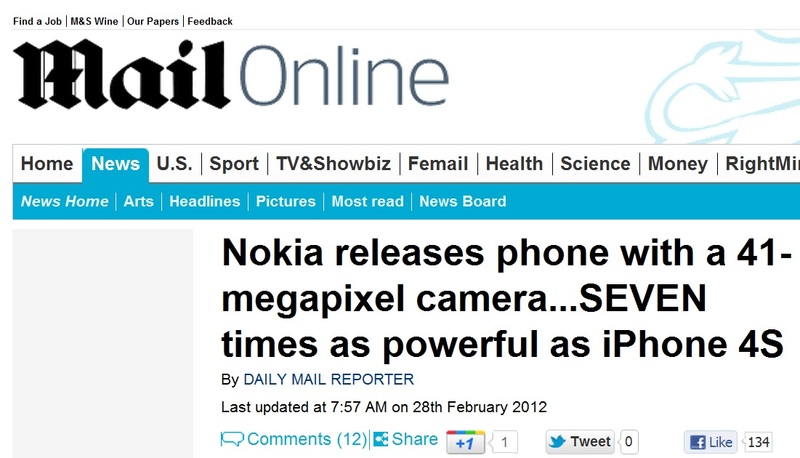 BTW Nokia camera phones besting iPhone isn’t new but it’s possibly only now that the public might be aware of it. Being mainstream media, they have no quarrels over Symbian. Folks really don’t have that much of an issue as they’re not too aware what it is. They just want things that work. Then you have the idiots in the comment section who think they know things about cameras. They are just above the general non techy public but not quite a geek, so they recite that megapixel myth thinking they’re oh so clever knowing it’s not just megapixels. There are many factors that affect image quality, so the most important thing we can go on for definite are results, and as we have seen they are impressive. For what ever numbers or science that gets tossed out the window, pictures will paint you thousands of words in favour of the Nokia 808 PureView producing high quality images you don’t expect in phones. Worried about the person who upvoted this too. So what is the quality of the lens used by this ‘toy’ camera??? 38mb x 3 ( as there are 3 colour channels per pixel) = 114MB uncompressed file size. If the compression used is JPEG, which is a ‘lossy’ compression, then how much compression (and, thus, loss of information) will be required to get a file size small enough to text or send by email? This is possibly ignorance rather than purposeful misinformation. In a way, it’s good that the printed newspaper (if this did get to print) won’t have a comment section for idiots (but then again, you have to be careful about the actual article not being up to scratch on what they say, eh). Well, not all the comments are dumb. Camera’s. It’s all about the lens. There’s a Carl Zeis on this so it may even take a respectable picture (for a phone). Whilst the screenshot comment is right in that 41mp sensor is good to market BUUUUUUT it’s not even just about that. The purpose was never about taking tons of pixels. The PureView is ALL ABOUT IMAGE PERFORMANCE, QUALITY AND VERSATILITY. 41MP perhaps to get it noticed, but also 41MP and PureView to actually produce some pictures to knock your socks off. There’s no deception going on there, if anything there’s quite a bit of underselling. Quite a big part of the misunderstanding is Nokia’s own poor launch and explanation on the CRITICAL aspects of the Nokia 808 – how it’s actually not about MP at all, how it IS about their precious sensor and how it’s damn forkin bigger than the point and shoots of today. I have a rant I started up to talk about this possibly on Monday so I’ll save you from it this weekend.